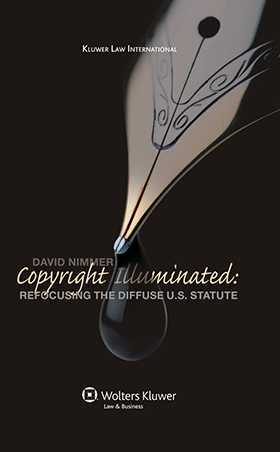 For several decades now David Nimmer has maintained a steady flow of insightful, witty, and deeply-informed commentary on copyright in the law journals. His well-earned reputation as a major authority and theorist on copyright law is unassailable. • substantial similarity of computer programs. Although the volume collects articles originally published between 1988 and 2006 (mostly in the past few years), Nimmer has scrupulously updated the texts and woven them together into a unified whole. What the book offers as a result is a microscopic scrutiny of the U.S. Copyright Act of 1976 and all its amendments, with an immeasurable abundance of interpretation grounded in the author’s unmatched familiarity with the law and its application. This is a work that no lawyer handling copyright cases—or indeed no student or scholar of any branch of intellectual property law—will want to be without. Preface. Acknowledgements. Table of Abbreviations. Part One: Confronting the Statute as a Whole. 1. Codifying Copyright Comprehensibly. Two: Renewal and Termination. 2. Abend in Myth and in Fact. 3. Abend’s Stepchild. 4. Sound Recordings, Works for Hire, and the Termination-of-Transfers Time Bomb. 5. Preexisting Confusion in Copyright’s Work for Hire Doctrine. Part Three: Revisiting the DMCA. 6 . Repeat Infringers. 7. Inaccessibility. Part Four: Fair Use. 8 . “Fairest of Them All” and Other Fairy Tales of Fair Use. 9. A Modest Proposal to Streamline Fair Use Determinations. Part Five: Effect on Other Entitlements. 10. Copyright Ownership by the Marital Community: Evaluating Worth. 11. The Moral Imperative Against Academic Plagiarism (Without a Moral Right Against Reverse Passing Off). Part Six: In the Realm of No Statute. 12. The Successive Filtering Method to Determine Substantial Similarity of Computer Programs. 13. Access Denied. Coda: Promises! Promises!